Hot glue two googly eyes to the front of the Halos mandarin. Use scissors to cut a small circle “nose” from felt and hot glue in the middle below the two eyes. Use a sharpie to draw the bunny mouth. 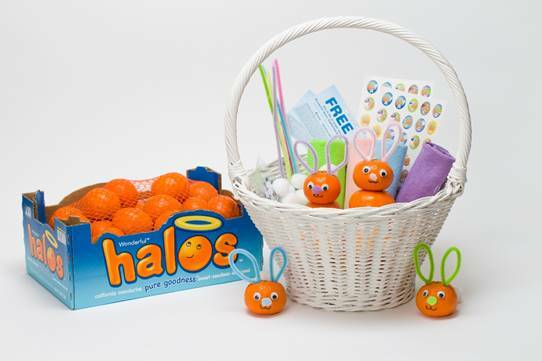 Hot glue the pom pom “cotton tail” to the back of the Halos mandarin. You could even decorate one like an Easter egg and make designs and colors all over it.